Home Being Pinoy Best Food Travel This is it, Pancit! Italy can take pride of their pastas that Italian food in Singapore also gets searched by people even in other parts of the world. China can boast their ramens that lots of restaurants from neighboring countries, including Manila, offer them. But though we crave for different noodles, nothing beats our appetite for pancit. Pancit is the most widely known type of noodles here in the Philippines. We Filipinos are so fond of eating pancit that we can devour over it both in the morning for almusal (breakfast) and afternoon for merienda (viand). Mind you, we can even pair it with rice and bread (Yes, carbs and another carbs!) That’s how we love pancit! Where does pancit came from? As per studies, the word pancit does not originate from Filipino. It is in fact from a Hokkien word “pian e sit.” It means “something conveniently cooked.” Moreover, historians concede that pancit is not an original Filipino cuisine. Between tenth and sixteenth century, before Spaniards colonized the Philippines, traders from China sailed here in the country. Said Chinese merchants ran out of their food supplies during that time and possibly made their own noodles and substitute or replace rice flour for wheats. Pancit is conceived to be one their major contribution and influence to us. Being creative is already in our blood. We can’t simply let pancit be as how it has been introduced to us. 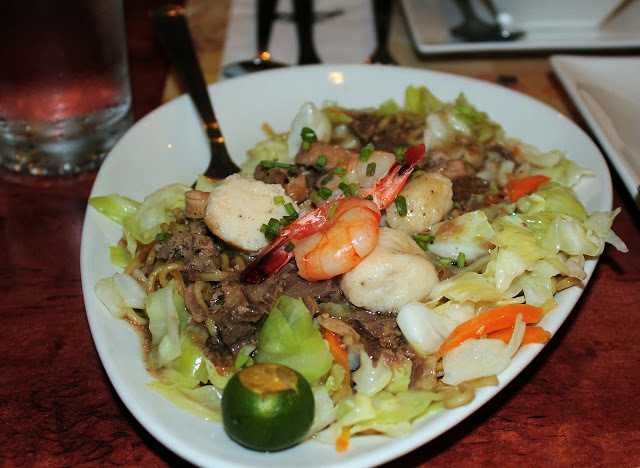 Throughout the years, Filipinos were able to put variations to simple pancit dish. And so, the original pancit that merchants have brought and taught us evolved and still continues to evolve in many new varieties. Some popular available pancit dishes today are Pancit Habhab of Lucban in Quezon, Pancit Bato of Camarines Sur in Bicol, Lomi of Batangas, Pancit Malabon of of course, Malabon, Pancit Luglug of Pampanga, and Pancit Estacion of tanza in Cavite. These are only some; we could honestly go all day naming many more pancit dishes. Though, the two major of pancit that will never be missed in almost all fiesta tables are Pancit Bihon and Pancit Canton. Whilst Pancit Canton uses an egg noodle that appears like the noodle commonly used in spaghetti, Pancit Bihon, on the other hand, has a thin and almost clear rice noodle. Both of these dishes are often garnished with pork, chicken, and/or shrimp; and vegetables such as cabbage, bell peppers, onions, carrots, and celery. If you’re a true blue Filipino or have long been here in the Philippines, you probably have heard the saying from our ancestors that if you eat pancit, you’ll get to live a longer life. As much as I want to explain the reason behind this, all I know is that it’s because of the length of the pancit itself. Other than that, I can’t find ay article expounding on this saying-the story behind and who said it first. Perhaps you can try asking your grannies about the origin of this long life noodle and share it with us. I know readers are looking forward for it, too. Pancit doesn’t only reflect our extreme love for food; it has also played a major part of rich culture. The dish is nearly, if not fully, linked to ancient Filipino superstitions that the dishes signify long life and health. That is why they believe that it should not be cut short to preserve the belief. This is also the reason why it is commonly served during birthdays, New Year’s celebrations, and baptisms.